Mums are busy women. Whether they are stay-at-home or employed mums of babies, toddlers, teenagers or a combination, including adult children living at home, the demands are endless. The ‘me time’ for mums at the end of each day is non-existent. Or is it? 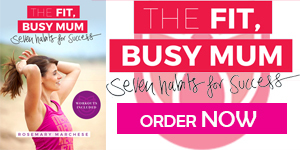 In The Fit, Busy Mum: Seven habits for success, physiotherapist and fitness and health author Rosemary Marchese is having none of it. 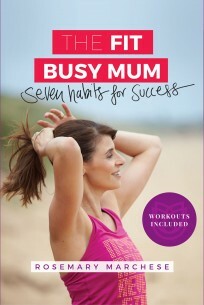 Rose knows that busy mums can also be fit mums. As a mother of three she ‘gets’ that all mums are busy, all the time. And she doesn’t set out to change that. Instead, she outlines how best to use the time there is with a practical, no-nonsense approach to fitting the ‘fit’ into every day. Drawing on more than 20 years’ experience in the fitness and health industry, Rose will help you learn the resourceful ways to exercise and shares her Seven Habits to Success so that you too can be that fit, busy mum. Rose is a fit, busy mum of three who is passionate about empowering families to lead fit, healthy lives. While writing this book, she continued to maintain her growing online presence, present at expos, spend quality, active time with her healthy kids and stick to her daily 30-minute workout. She believes in keeping it real, and realistic. “Mothers are inundated with information on how to regain or attain fitness, strength and health. Rosemary’s advice is effective, safe and based on facts, not fads. This book allows all mothers access to incredibly professional guidance, from a highly respected fitness expert”. Can you be fat and fit? And what’s the big deal if you are TOFI – thin on the outside and fat on the inside? Find out on Saturday 30th April (8.30am) where I present ‘The Obesity Paradox: Can you be fat and fit?’ See you in Melbourne! So many busy working mums are stuck in a fitness and health rut. Here me speak about ‘The Fat Trap’ at the 7th Annual Australian Virtual Assistants Conference on March 19 in Sydney! See you in Manly! Mums are busy women. The ‘me’ time for mums, including time for health and fitness, at the end of each day is non-existent. And there lies the trap – the Fat Trap of Motherhood. In her presentation Rose will also address the ever growing ‘Skinny fat’ mum who inevitably is TOFI – thin on the outside and fat on the inside. Rose is a fitness expert and physiotherapist, but she is also a mum of three. Rose will share her Fit Busy Mum proven strategies for success so that mums can get out, or avoid, the Fat Trap of Motherhood.